A breakthrough way to try-on brilliant color with no commitment! 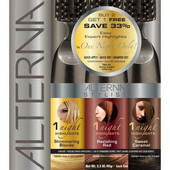 Alterna 1 Night Highlights Temporary Color Mousses allow you to glide on stunning, natural-looking, chemical-free highlights that are easy to apply or remove at a moment’s notice. Mineral-rich, crème-mousse formulas dry quickly and won’t flake off once dry. Fast, easy, no mess color application delivers professional-looking results that wash out completely with just one shampoo. Free of ammonia, peroxide and synthetic color.